The Berlin-based webhost developed a holistic Green IT strategy. With over four million domains and about 35,000 servers, electricity is the largest direct cost. STRATO sticks to two rules: Conserve energy and buy energy from renewable sources. STRATO has managed to cut the electricity consumption per customer by 30 percent within 18 months. Energy can be conserved in four key areas: hardware, software, resource management and building services engineering. 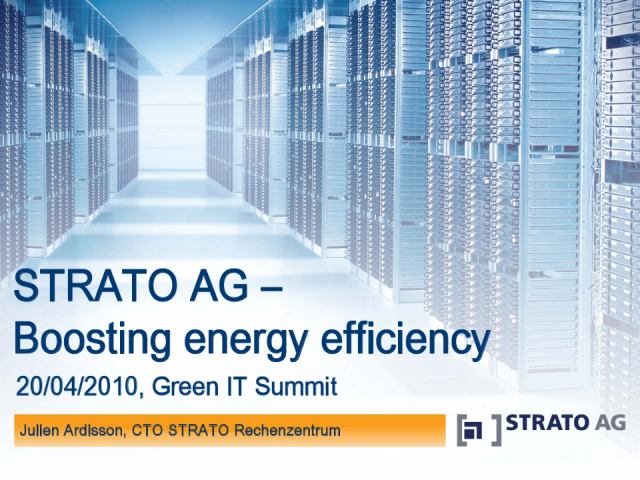 In addition to becoming more energy efficient, STRATO has switched to energy from renewable sources in 2008 and operates both its data centres with carbon-neutral energy.